Primary ciliary dyskinesia (PCD) is a disorder characterized by chronic respiratory distress that has a history of going undiagnosed. Combined whole-exome sequencing (WES) and copy-number variant (CNV) analysis can aid in diagnosing patients with PCD, according to research published in G3 this month. PCD arises from mutations in cilia-associated genes—and results from the paralysis of motile cilia. Normally, cilia on respiratory epithelial cells beat to move mucus along the tract; without this motion, mucus can build up and lead to respiratory infection. These cilia defects can also cause reproductive problems, hearing loss, chronic sinusitis, and situs inversus (where the left-right organization of the internal organs is reversed). 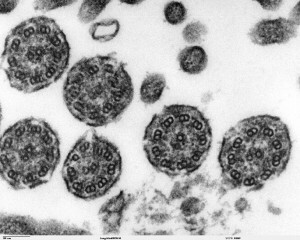 Efficient diagnosis of PCD is a challenge; there are 32 genes associated with the disorder, and previous diagnoses have relied on electron microscopy (EM) of cilia to analyze their structure. In this recent paper, Marshall et al. present a cost-effective and efficient genetic workflow that uses WES combined with CNV analysis to identify causative mutations in PCD patients. Sanger sequencing has been effective in the past, but as genes continue to be added to the PCD-associated pool, sequencing individual genes becomes time-consuming and costly, and not all genes can be effectively sequenced this way. Additionally, copy-number variation is seen in around 10% of autosomal-recessive disorders (like PCD) but is undetectable by Sanger sequencing. The researchers analyzed 20 unsolved PCD families through a combination of WES and CNV analysis. They found that their approach was useful for identifying biallelic pathogenic mutations, obtaining information on all known PCD genes, and identifying possible variants of unknown significance that could be associated with PCD, leading to an overall diagnostic rate of 76%.